We will meet in two 4-hour sessions (12:00 - 4:00) that are 2 weeks apart. This will give you time to work on your collage at home. Due to the size of the projects and classroom, we can only accommodate 3 students per class. Value - Color and fabric motifs are very important to this process, so we will spend some time looking at and sorting fabrics. I will go over Laura Heine's general collage directions, demonstrate the use of an underlay, and assist participants as they begin creating their collage in class. Please let us know which pattern you will be using. A variety of patterns means there may be a variety of methods. 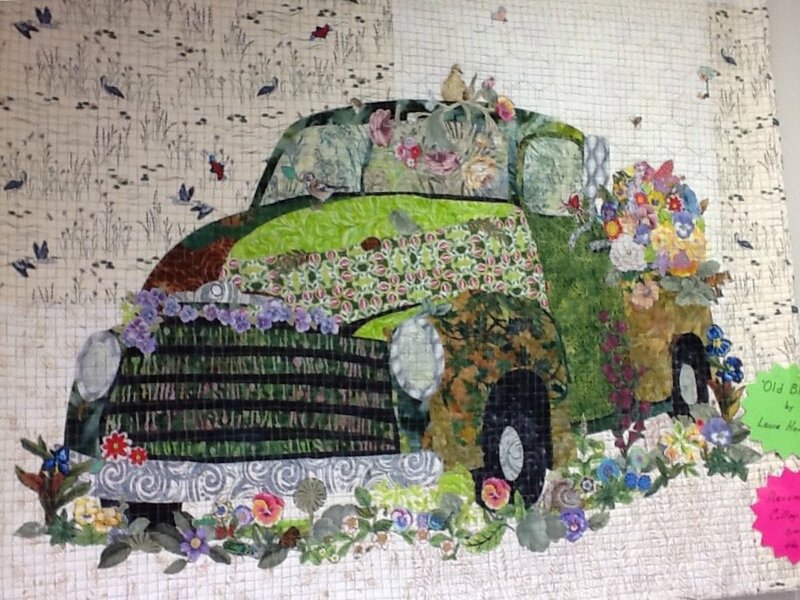 Some of the larger patterns (camper and truck) suggest pieced backgrounds. For the camper, you may need to bring a sewing machine to class. Collage is a process that takes a lot of time. On your own between sessions, continue to cover the pattern with underlays. For the truck, you may want to sew the background pieces together. Continue to collect and cut a variety of motifs, plants and flowers for our second session. During the second session we will begin with a group critique of our collages. We will iron the collage to make it permanent, cut it out and attach it to the pieced background. Bring your sewing machine if you would like to piece the background in class. The final step is adding motifs, flowers and plants to the object and background. Some students may be ready to permanently attach the second round of collage by the end of this session; others will finish at home. Participants will need to add backing, batting and quilt the completed project at home. Requirements: Pattern by Lara Heine along with supplies listed on the pattern. Pattern Ease is recommended for all of her patterns even though the earlier ones suggested Voile. The truck pattern includes a chart with suggested fabrics. I will provide a copy that converts that to values and includes minimum size needed. Fat Quarters will work for most pieces; you may want longer strips for directional fabrics. My measurements are very generous. Participants should have a basic knowledge of sewing and finishing a quilt with batting and binding because they will be finishing the project on their own. Prior collage experience is not necessary. 100% cotton fabric scraps as small as 4 x 6 inches are perfect for the second part of this project. Look for fabrics with flowers, fish, birds, leave and other things that you can easily cut out and use to build your collage. Steam-A-Seam, a Pressing Sheet, and an iron are absolute necessities. A design wall is very helpful for this process. Good scissors for cutting small details. A sewing machine if you are piecing the background. Instructor Bio: Linda Nowak; linwak@gmail.com; 315-250-1327 After completing one of Laura Heine's quilts (Hazel Nutt) I created my own collage quilt from a photograph. I was a K-6 Art Teacher before my husband's job brought us to TN. I have been quilting since 1982. I like to try everything at least once -- hand quilting, English Paper Piecing, T-shirt quilts, applique, machine embroidery, and more.